France's state rail company has for the first time publicly expressed regret for its role in transporting Jews to Nazi death camps in World War II. 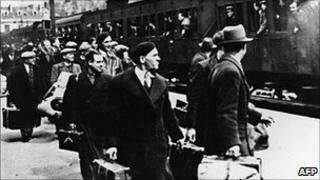 Until now, SNCF has said its workers were forced to assist in deportations by the occupying German army. The change of language is clearly linked to the lucrative market for high-speed rail contracts in the US. The company has been criticised in the US for failing to apologise for its involvement. French state-owned trains and state-paid rail workers were responsible for carrying some 76,000 Jews from France to Germany and the east in World War II. Only a few of them returned. Ever since, SNCF has insisted that it was not responsible: the rail operator was requisitioned by the German occupier and workers had no choice but to obey. But now on a trip to the United States, the rail company's chief executive Guillaume Pepy has issued a statement that goes much further. He said that SNCF expressed its "profound sorrow and regret" for the consequences of its actions. As a statement of contrition, it is unprecedented, but it does not come out of the blue. In two US states - California and Florida - SNCF is hoping to win multi-billion dollar contracts to build high-speed rail links, similar to the ones that it has operated for years in France. However, in both states there have been efforts by some lawmakers and Jewish groups to bar from the bidding any concern that does not come clean about its wartime role in the deportations. The French company is clearly the target of these moves, which have been decried by some as patently protectionist in motivation.